Child labor legislation: effective, benign, both, or neither? 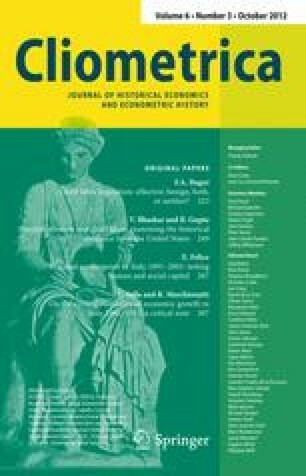 This paper explores the relationship between the state-specific child labor legislation and the decline in child labor that occurred in the US between 1880 and 1900. The existing literature that addresses this question uses a difference-in-difference estimation technique. We contribute to this literature in two ways. First, we argue that this estimation technique can produce misleading results due to (a) the possibility of multiplicity of equilibria and (b) the non-linearity of the underlying econometric model. Second, we develop an empirical strategy to identify the mechanism by which the legislation affected child labor decisions. In particular, besides establishing whether the legislation was effective or not, our analysis may determine whether the legislation constituted a benign policy or not, i.e., whether the legislation constrained the behavior of families (not benign) or whether it changed the labor market to a new equilibrium in which families voluntarily respected the law (benign). I thank the editor Claude Diebolt and three anonymous referees for comments and suggestions that have significantly helped to improve this paper. I am also thankful for helpful discussions with Esteban Aucejo, Arnau Bages, Joe Ferrie, Jon Gemus, Silvia Glaubach, Joel Horowitz, Viktor Subbotin, and Giovanni Zanalda. Erik Vogt provided excellent research assistance. Any and all errors and omissions are my own. Financial support from the Robert Eisner Memorial Fellowship and the Dissertation Year Fellowship is gratefully acknowledged.